Each workshop is creatively designed to be both informative and fun, including many of the entertaining elements offered in performances: storytelling, music and dance. Participants engage in interactive discussions that help to direct the workshop toward issues that are important to them. Hands-on, interdisciplinary activities model successful educational techniques that make use of the local learning center, grounds and environment. Every participant receives handouts with background information and suggestions for teaching with a sensitivity for other cultures. Workshops end with a thorough introduction to the available educational resources in those particular subjects. College Credit and recertification credit can sometimes be made available. Native American stories serve as springboards for activities that introduce children to the natural world. This workshop provides tools and techniques for helping children to study science, nature, Native Americans and environmental stewardship. Caduto will share music, dance and traditional storytelling techniques, showing how to bring the magic of his bestselling books to life for children ages 5 to 12 (K-6), including Keepers of the Earth, Keepers of the Animals, Keepers of Life and Keepers of the Night . Michael's books have proven exceptional for tying together many aspects of the curriculum through stories, information and activities . Books are based on complete, experiential curricula (K-6) for the study of every aspect of the environment, including wildlife ecology, botany, habitat and environmental ethics. Participants explore of the many ways to teach environmental ethics. This participatory workshop begins with a look at the meaning of environmental values and ends with practical exercises for incorporating the study of ethics into educational programs for kindergarten through adult. Along the way, we will share stories from several cultures, music, hands-on activities, spirited discussion and even a culminating dance. This workshop is the perfect springboard for conducting experiential activities that promote environmental awareness and Earth stewardship. Handouts are provided. Related books and curriculum materials are available. Stories from around the world entertain as they introduce experiential activities that promote environmental understanding, cross-cultural awareness and Earth stewardship. This original approach, called Ecological Education, is inspired by natural law and it reflects the diversity of human intelligence, cultural diversity and biological diversity. 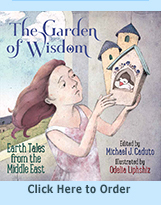 Michael shares how to use his award-winning books for children, including Earth Tales from Around the World (recipient of the Aesop Prize). Water and the life that it harbors are like a magnet for curious minds. From lily pads and pond muds to swamps and marshes, and from still pools to the rolling ripples of the stream and river, we'll visit an aquatic environment near your learning center and explore the conditions for freshwater life, the survival adaptations of aquatic plants and animals, and the human impact on these environments. Puppet shows, activities, slides of freshwater creatures, and numerous outdoor explorations and measurements bring the nature of fresh water to life. Copies of activities and follow-ups, plus a resource guide to curricula and books for freshwater study, will be supplied at the workshop. Several different curricula will be available for review and participants will receive an annotated bibliography of available resources for teaching about Native Americans in northern New England and beyond. This workshop creates a picture of Abenaki Indian culture, past and present, using stories; artifacts; an imaginary visit to an Abenaki village; discussion of Abenaki culture, beliefs, and seasonal life cycle; and a review of available teaching resources. The practical and common questions about Abenaki culture are emphasized: How and where did they live? What did they eat? What was it like growing up as an Abenaki Indian one thousand years ago? What did they believe in? Where do the Abenakis live now? What is the present state of Abenaki culture in this region? Participants share in the imaginative process of storytelling and are introduced to how stories, songs, chants and dances can be used to explore other cultures. Ideas for activities and resources help students draw from Native wisdom when developing a sense of place and living sustainably with the natural world. Participants are immersed in a rich context that they can draw from when teaching about Native cultures and environments, past and present. Based in part on the book by Michael J. Caduto, A Time Before New Hampshire:The Story of a Land and Native Peoples, published by the University Press of New England & University of New Hampshire. "Your sensitivity and diversity of presentation styles was appreciated. Your commitment was moving." Through storytelling, creative involvement, music, dance and discussion, we will explore the different kinds of stories, the role of stories in our lives, families and cultures, including Native peoples. Activities will focus on methods for learning stories, ways for setting the stage, storytelling techniques, the use of stories in teaching and methods for choosing and telling stories with a sensitivity to the cultures of origin. Story and song introduce the ancient traditions of Native American gardening. Slides, hands-on activities, games and a demonstration of gardening plans and techniques show how to plan, plant and tend a historically-accurate Native garden. This workshop shares how to preserve ancient plant varieties--to participate in gardening as part of the Circle of Life. We also explore the harvest, recipes and suggestions for garden crafts and games. Michael draws from his book: Native American Gardening: Stories, Projects and Recipes for Families . Popular author, master storyteller and award-winning environmental educator Michael Caduto studies the specific exhibits and cultures presented in your museum and chooses related stories that will bring those exhibits to life. Caduto then conducts a staff training workshop in which he shares Native American tales and traditional storytelling techniques, showing how to bring the magic of storytelling into your guided tours for the visiting public. These courses and workshops have been taught at Oglethorpe University (Atlanta), the University of Southeastern Alaska (Juneau), the University of North Carolina at Chapel Hill, Swarthmore College, the University System of New Hampshire, Pennsylvania State University, Saint Bonaventure University (New York), University of Arkansas-Fort Smith, Texas A&M University, Castleton State College (Vermont), Lyndon State College (Vermont) and the Community College of Vermont. Adjunct teaching includes the University of Michigan; Marlboro College (Vermont), Johnson State College (Vermont) and Lesley College (Boston, Massachusetts); College of the Atlantic (Bar Harbor, Maine) and Vermont College (Montpelier, Vermont). These courses can be run as an 8-part series of 2-hour workshops (group size limit: 20). They can also be run in different time frames, such as three all day sessions, or as single sessions on specific topics, including mammals, birds, reptiles and amphibians, insects, or Native American animal lore and practices. Provides a basic background in ecological principles through hands-on methods for motivating children to study plants, animals, physical science, and environmental issues, both in natural and human-made environments. Features puppet shows, games, sensory awareness activities, and more--conducted in the learning center and outdoors. Suitable for teachers, naturalists, and anyone interested in sharing nature with children. The course emphasizes mastery of experiential teaching methods as well as designing creative and original activities. Handouts are provided. This course uses Abenaki animal myths and storytelling, activities, puppet shows, guided fantasies, games, and field experiences to teach children about the animals of Northern New England and their importance to the Abenaki Indians. We explore the animals' survival adaptations for gathering food, finding shelter, keeping warm, and camouflaging. Animals will be studied as a natural community, and a conservation project will emphasize our role as stewards of the animals around us. Many original activities will be used.